The last days of summer are fading along with the leaves… but just as the leaves will fade to gold, so must we create this golden opportunity to prepare our gardens for the winter to come and the next spring to arrive. 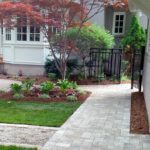 What is the importance of a fall cleanup? Why should we put our beds to rest in the fall? Now if what you’re thinking is that it’s time to “hack-it-all-down” then “rake-it-all-up”, hold that thought. Hold it, and then let it flutter away with the first leaves of fall. Gone are the days of sterilizing your green spaces. This is for two very important reasons. Leaving as many plants up and uncut supports wildlife throughout the winter. Leaving seed heads on shrubs and flower stalks will help feed birds that overwinter here during a time when food is most scarce for them. Keeping as much organic matter in the beds keeps nutrients right where they need to be – with the plants that used them! The roots of a plant are the foundation to creating a plant that flourishes and a good root system can only be built through a healthy, nutrient-rich soil. Cover water features with netting to collect falling leaves. Plant new trees and shrubs, to give them at least six weeks before frost. Continue watering trees and shrubs until the ground freezes. Pull weeds before they go to seed to reduce the number of weeds next year. 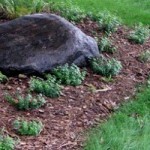 Cut diseased areas out of perennials. Do not compost. Rake and compost any fallen leaves. Trim tall grass away from trees and corners of your home to discourage small rodents from creating nests. Dig up tender bulbs such as dahlia, canna and gladiola. Wrap them in moist material and store in a cool, dark space. Divide spring and summer blooming perennial plants. Buy bulbs to force for winter. Wrap screening around fruit tree trunks to protect from small animals. Amending Soil – How do we do that? The black ‘dirt’ created from the decomposition of plant matter (leaves, vegetable scraps, plant stalks etc.). In order for things to decompose into healthy compost, beneficial microbes – these are comprised of various bacteria like cool little guys called ‘actinomycetes’ (FUN FACT: these guys are also used to create things like antibiotics and a bunch of other amazing medical compounds!) and fungi. These guys are what actually “feed” plants their nutrients by making them more accessible to their roots. This is the best way to improve your soil’s structure because it improves its ability to hold and release crucial nutrients. A component of rich compost is ‘humus’ and it binds important nutrients like calcium and magnesium in the soil; keeping them from leaching out. Applying compost to your gardens is easy but how you do it is important and based on what kind of soil you have pre-existing in your beds. If you have relatively good soil, that’s loamy (this means a somewhat even mixture of sand, silt and clay soil types), then you can simply top-dress your gardens by adding an even layer of compost that’s 2”-4” thick and lightly rake it into the soil. To apply near plants, you’ll want to mix the compost into the soil starting about an inch away from the base of the plant and all the way out to the drip-line (the leafy canopy). It’s very important to try and avoid disturbing the roots. If you have a plant with shallow root structure, it’s better to leave a 2” layer on top and let it break down slowly into the soil. If your soil is not looking too good (don’t worry, you’re not alone! ), then tilling it in is recommended. It can be a little tricky if the garden bed is filled with perennials but it’s well worth it – your plants will welcome the goodness you’re returning to the soil around it. This can be another form of compost but is comprised of the excrement of herbivorous animals. You can get plenty of the three main macronutrients your plants need: Nitrogen, Potassium and Phosphorus from manure, as well as many micro-nutrients. Manure makes a great substitute for harsher, chemical fertilizers. The most important thing to remember about using manure as a soil amendment is that the older it is, the safer it is to use around your plants. This is because fresh manure is highly acidic and can burn plants. Buying aged manure reduces the risk of not only shock to your plants, but also reduces the existence of bad bacteria like E. coli. There are two ways you can apply manure to your garden bed: spreading it evenly across the beds at roughly 2”-3” thick and letting it break down and permeate through the soil over winter or diluting it by tilling and mixing it into the soil around your plants (but not directly where the roots are!). A happy plant is a growing plant. A growing plant can become an aggressive plant. An aggressively growing plant can rapidly make any garden look messy, overgrown and unkempt. Plants that are allowed to grow and overtake a space hurts itself as much as the pretty neighbours around them. Just as we must trim our hair to keep us looking our best and our hair looking healthy, so to we must trim our plants for the same reasons. Dividing plants regularly ensures healthy, robust plants that will continue to perform year after year. It’s also a cost-effective (free!) way of getting more plants! Did you have a side bed somewhere that’s been sitting empty, lonely, and throwing shade on your otherwise awesome outdoor space? Dividing your existing plants and transplanting them into such spaces is one of the best ways to tie in that underused space to the rest of your landscape as well as brighten the whole space up through making overgrown plants look fresher and give them more room to grow again. When should we divide and conquer transplant? There is a lot of debate over whether it is better to divide and transplant in the fall or the spring. The short answer is you can do either so long as it doesn’t happen whilst they’re in bloom or about to bloom. The longer answer has to do with diminishing as much shock to your plants as possible. In the spring the soil is more saturated with water, which can lead to soil compaction and compromise the environment in which roots need to grow. It’s also important to note that since a lot of bulbs are beginning to poke up through the ground in the spring that delicate fresh growth is at risk of being crushed and trampled while we divide and transplant around them. One last point to consider about spring division and transplanting is that the soil itself is still very cold from the month’s long winter, which will slow the development of root growth and its establishment period. In the fall you tend to worry less about what might be at risk of being trampled. You’re already removing annual bulbs to be overwintered inside and any remaining annual plants are going to be removed anyways. While the soil will be getting and staying wetter as the season progresses, you don’t have to worry as much about soil compaction – you’re going to be working that soil with an amendment and tilling or lightly mixing it in anyways. If you think you’ve walked too much in one area, you can fluff it up again while you condition the soil. Again, to compare with spring division – the soil is still nice and warm from the summer season, so as long as you’re diving and transplanting early enough (approx. 4 weeks before first frost) you’ll give your plants ample time to develop an extended root system before they go dormant for winter. Spring and early summer flowering plants like iris, daylilies and peonies should be divided and transplanted in the fall. Make sure this is done after a few weeks have passed since they bloomed. Late summer and fall blooming perennials like asters, black-eyed susan and lobelia should be divided and transplanted in the spring, just after the new growth begins to emerge. Dig at the drip line. Dig a trench around the base of the plant you want to divide. This allows you to keep most of the roots intact and pop the plant out with minimal damage. Once the plant is out, slice it carefully around its base (keep the stems as intact as possible – you want the roots to sever and release into small clusters) in half, quarters or however many divisions you wish to make. Divide in cool weather. This helps keep roots cool and moist and diminishes the shock they’ll get from being uprooted. 10°c and 50% humidity are the most ideal conditions for holding divisions until you can get them back into the ground. If it’s a little warmer than that and you’re unsure about the humidex, you can simply lay them in a cool, shady spot of the yard and give the roots a very light water (just enough to get them moist again) until you’re ready to transplant. Replenish soil with organic matter. If you remove a lot of perennials, then you should backfill those holes with compost or triple-mix before replanting. This is a good way to be proactive and inhibit potential pest problems by supplementing with nutrient-rich soil. Use pieces that are at most, 25% of the original clump. There is an equilibrium that plants strive to maintain between their roots and their shoots (this is known as the root: shoot ratio). A large plant that has lost a lot of its root system will experience die-back to maintain this ratio and the reverse will also happen. Smaller sections or a divided plant root more quickly grow more vigorously, producing healthier, longer-lasting blooms. Keep only the healthiest pieces. Do not keep any pieces that look damaged, diseased, or infested with pests. Spread out your divisions, then plant! Make sure the holes you make for your divisions are at least as wide as the roots. Don’t wrap roots around a plant or turn them up to fit them in an undersized hole – you run the risk of creating girdling roots which can bind and choke out your plant as it stabilizing in the ground. Don’t have the time? Need help? Call us! Here at Quiet Nature, we understand how hectic the fall months get. 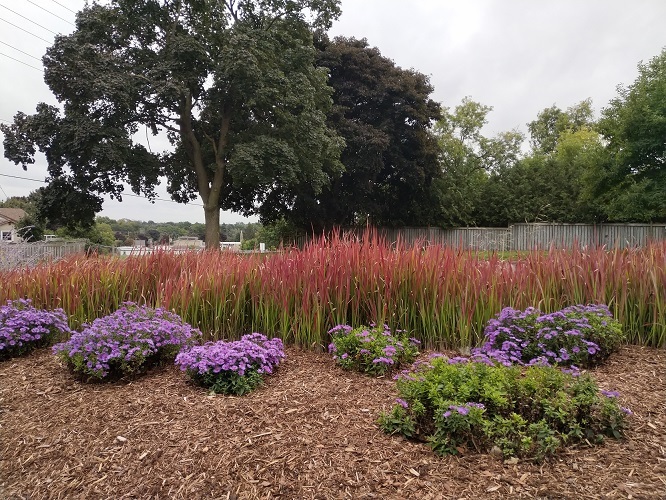 If you’re feeling like you need assistance this season getting those beds and perennials prepped for the coming spring season, we’d be happy to help! Every member of our team undergoes extensive training and our detail-oriented approach speaks for itself. 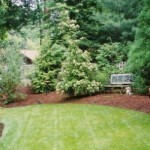 Rest assured that your gardens are in good hands with an experienced team.